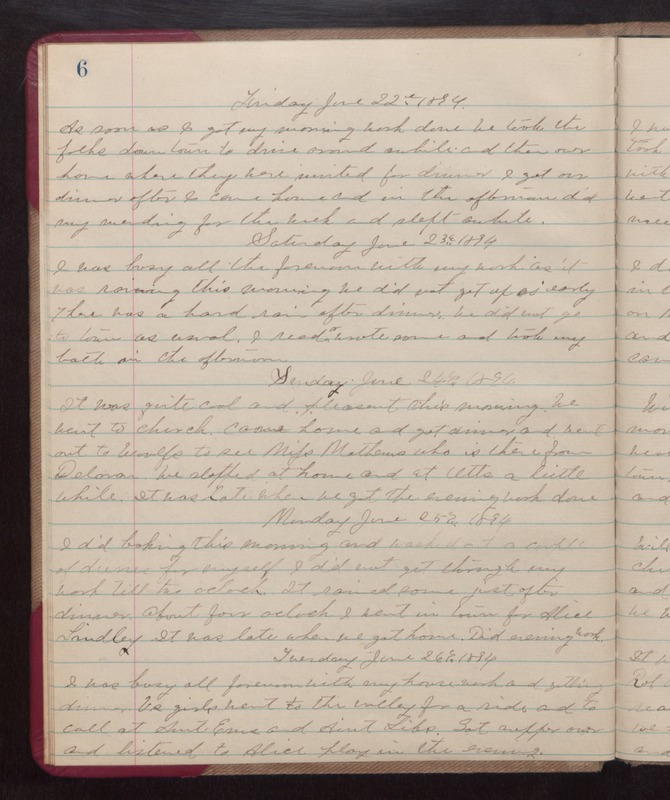 Friday June 22nd 1894 As soon as I got my morning work done we took the folks downtown to drive around awhile and then our home where they were invited for dinner I got on dinner after I came home and in the afternoon did my mending for the week and slept awhile. Saturday June 23rd 1894 I was busy all the forenoon with my work as it was raining this morning we did not get up early There was a hard rain after dinner, we did not go to town as usual. I read or wrote some and took my bath in the afternoon Sunday June 24th 1894 It was quite cool and pleasant this morning. We went to church. Came home and got dinner and went out to [illegible] to see [illegible] Mathews who is there from [Delovan?]. We stopped at home and at Utts a little while. It was late when we got the evening work done. Monday June 25th 1894 I did baking this morning and washed out a couple of dresses for myself I did not get [through?] my work till two oclock. It rained some just after dinner. About four oclock I went in town for Alice [Lindley?]. It was late when we got home. Did evening work. Tuesday June 26th 1894 I was busy all forenoon with my housework and getting dinner. Us girls went to the valley for a ride and to call at Aunt [Ems?] and Aunt [Libs?]. Got supper on and listened to Alice play in the evening.